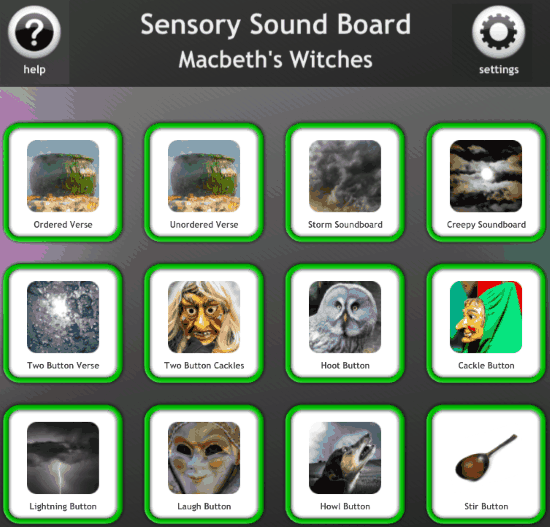 Macbeth Witches is a free soundboard to create funny scary sounds for Halloween. Its a simple soundboard software mainly used for kids. It has a set of sensory icons on its interface which when pressed, opens a single or a list of buttons which create scary sounds when pressed. It allows you to choose among sound effects like Monster Voice Effects, Echo Voice Effect, Single Sound at a Time, Many Sounds at a Time, etc. It also allows to choose Photo art or Cartoon art for images on icons and buttons. You can also choose to Enable Dwell detection to automatically play sound when hovering mouse over a button. You can make the sounds even scarier by adding echo effect or monstrous sound effects, via its settings. If you are looking for a funny and scary soundboard for kids this Halloween then Macbeth Witches is a good option for sure. And it is as easy as it gets. 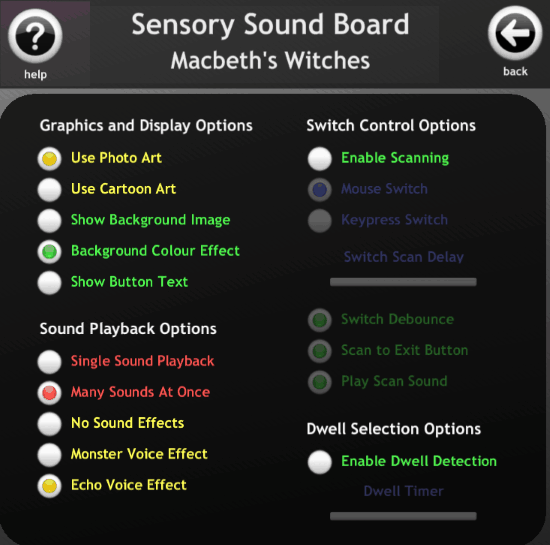 Macbeth Witches a free for non commercial use soundboard application. It plays some built in scary sounds when you click on different buttons under different icons. Its a very easy to use scary soundboard, where all you have to do is download and install the software and then open it. Once the software is running, you can see that there are some scary Halloween themed icons on the the interface. These are the following icons on the interface: Ordered Verse, Unordered Verse, Storm Soundboard, Creepy Soundboard, Two Button Verse, Two Button Cackles, Hoot Button, Cackle Button, Lightning Button, Laugh Button, Howl Button, and Stir Button. Each of these icons when pressed, opens up one or more sound buttons related to them. For example when Ordered Verse is opened, it has the following sound buttons; Double Double, FireBurn, Fillet of Snake, Eye Of Newt, Baboon’s Blood, Dragon’s scale, Blindworm’s Sting, Tigers’s Chaudron, Boil and Bubble, Stir the Pot, Wind, and Crackle. You can also play multiple sounds by clicking on multiple buttons in a quick span of time. This creates some interestingly scary sounds. However for this you will have to configure the settings first. You can configure the settings from the settings icon on the interface. When you open the settings option, you can see that all the settings are listed under 4 groups. Use Photo Art: On using this option, Photo is used on the Icons and Buttons. Use Cartoon Art: This option changes the art on Icon and button to cartoons. Show Background Image: When selected, it shows a background image on the interface. Background Color Effect: This basically starts a color effect on the background of the interface. Show Button Text: You can select this to see the texts on the buttons. Single Sound Playback: When selected It only allows one sound to be played at a time. Many Sound At Once: You can select this option to play multiple sounds at once by pressing multiple buttons. No Sound Effects: As the name suggests, it bars any additional sound effects. Monster Voice Effect: This option adds a monstrous voice effect. Echo Voice Effect: You can add echo effect to the sounds using this option. Switch Control Option: This section basically contains all the options related to switch control.These options are basically used to switch between mouse control and keyboard control. These options are, Enable Scanning, Mouse Switch, Keypress Switch, Switch Debounce, Scan To Exit Button, and Play Scan Sound. Dwell Selection Option: This option when selected plays sound just by hovering the cursor over the buttons for some time. Enable Dwell Detection: You can enable Dwell Detection from here. You can also configure the dwell timer from here. Macbeth Witches are perfect for creating funny and scary sounds for kids on Halloween. So if you are looking to try some scary soundboard for kids then you should definitely try this out.